DG TV and Aerial Services are a well-established company based in Chesterfield, that has been in business for 20 years. We install and repair domestic and commercial aerial systems including MATV and IRS. Other services include repair and installation of TV aerials, extra TV points, satellite, Sky, Freeview, Freesat and generally dealing with TV related post digital switchover reception problems. Our engineer has 20 years of experience in the field and has City and Guilds qualifications. We usually offer same day service if possible and all work is guaranteed. Very good, pleasant & polite. Prompt & very efficient. Would recommend. Very good came back as lost signal it was a cable, did not charge for finding fault. A nice guy and helpful. Efficient, confident, pleasant, explained what the problem was, and cost of work before commencing. Came at very short notice, did an excellent job. Darren attended after intermittent problems with our television reception. He suggested two courses of action and recommended the cheaper one, which we accepted. The problem was resolved completely in an hour and a half. We now have perfect reception. The price was very reasonable and included 10% Gold Card discount. Darren is highly recommended. It was a windy day so wasn't sure if Darren would be able to do the work, but he turned up. Quick review of what we required and how and away he went. Cable was run neatly, signal tested and plugged into Humax box. Altogether happy with the job and would use again. Very pleasant and considerate. Took time to explain the problems and rectify them I would recommend him to anyone. Problem was diagnosed and fixed quickly and politely. Recommended. He responded to my phone call very quickly and sorted my TV problem very efficiently. This young man certainly knew his job - I could recommend him to anyone. Very good service indeed, would recommend him to anyone, and Trusted Trader. Rang firm hoping he could sort my television out. He came straight away and replaced my aerial. Clean, tidy and very pleasant. I was very pleased with the work done by this trader. Problems with lack of signal from aerial to TV points were identified and rectified very quickly and efficiently at a reasonable price. *Customer feedback* This man charged me �43 and didn't make recorder work properly. I phoned him back, but he still didn't make things any better, with a filter fitted he charged me another �70. *Traders reply* Mr X, whilst it's unfortunate that you still had a problem with your recorder, I notice that it's taken 16 months for you to acknowledge this and give the negative feedback. As a result of the delay I am unable to recall your specific case so cannot add much more apart from saying that if you had informed me of further problems I would have been happy to look into it for you. I am very satisfied with the work Darren did he was working after hours. Came at time arranged. Discussed job and price before starting. Efficient and through. Would recommend to anyone. Competitive price quoted and adhered to. Polite & courteous, clean & tidy. On time, knowledgably, a very good job at a reasonable price. I would recommend to everyone. Extremely pleased. Work all done professionally. Stayed late to extra jobs and left me content. This is the chap to ring, do not bother with anyone else. Darren did a fantastic job for me with my new aerial. This is the chap to contact. Don't bother ringing anyone else. He stayed late to make sure that everything was correct before he charged me. Extremely pleasant and a real joy to have working for me. I highly recommend. Darren to everyone. This is the chap for you. Would recommend DG TV and Ariel Services. He did a first class job for my 88 year old father in law. Large trees were getting in the way of the satellite signal so he installed a new dish where the trees would not block the signal. He ran new cabling very neatly and unobtrusively so that you would never know it was there. I rang him at about midday and he was round at father in laws about 4 hours later. An excellent job done by an excellent trader. An excellent trader who came when he promised. He knew what needed to be done. Quoted a fair price and completed the job on time. This trader did an excellent job at a very fair price. I would recommend him to anyone who needs TV and aerial work done. Very prompt service. Extremely helpful. Came out initially and did site survey. Gave me a quote which was very reasonable and this was the price paid. Very skilled, efficient tradesman highly recommend. I searched through the yellow pages to find a TV/Aerial specialist and seeing the 'Trusted Trader' logo and Darren's response on the phone, convinced me I had made a good choice. He was very efficient, professional and friendly. A very good job. He worked quickly, efficiently and gave good advice. Price was clearly stated at the outset. We would use him again and recommend him to others. On time, efficient, clean & tidy worker. Good service, fair price, work done to a good standard. The trader arrived and conducted the work in a very professional way. He persisted with the job despite inclement weather - including sleet and snow. On arrival the old ariel was unsafe hung by the power lead on the roof following storm damage. He made this safe taking account of public movement on the pavement below the house. After he left the property he followed up his work with a text message to ensure all was alright. I would recommend him to friends and family, without hesitation. The engineer fitted us in on the same day and worked on the roof in the pouring rain. He stuck to the price quoted even though it took much longer to sort out. Then he came back and fitted a booster with no extra charge when the signal was breaking up. He was very helpful. Excellent advice and service. He could not have been more helpful. A good bloke. Very polite & helpful. Sorted us out and did a proper job, would definitely recommend anyone. Thank you. Polite & clean, installation neat. 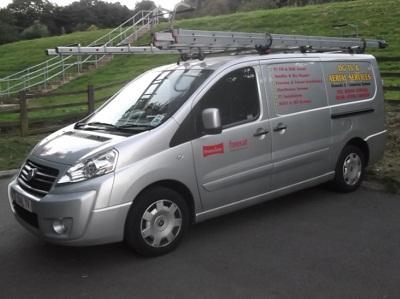 Darren quoted for a new aerial with signal booster and arranged a time to do the job. He arrived on time and quickly got on with the job. He assessed the booster was not requiredwhich reduced the cost considerably. I would have no hesitation in recommending him. Very proficient technical service, helpful and pleasant and punctual, sorted out our problem with TV aerial on the same day of call out. I would recommend. Good job done at a fair price. Polite and very efficient at diagnostic and repair. Recommended highly.